Karwa chauth is coming and according to legends it will be celebrated in India with a great enthusiasm. On this day ladies do fast for their husband and pray for them. Karwachauth is done during Krishna paksha chaturthi and kartik month of Hindu calendar. You will see this custom in Gujarat, Maharashtra, and southern India. ॐ कामरू, कामाक्ष देवी, जहाँ बसेलक्ष्मी महारानी,आवे,घर मैं जमकर बैठे ! सिद्धहोय, मेरा काज सुधारे, जो चाहू सो होय! ॐ हीं हीं हीं फ़ट ! Chant this mantra in night, starting from karva chauth night, follow it till next 11 nights,and afer 11 nights, ११ नारियल का हवन करना है "!! It differs from month name in different states. 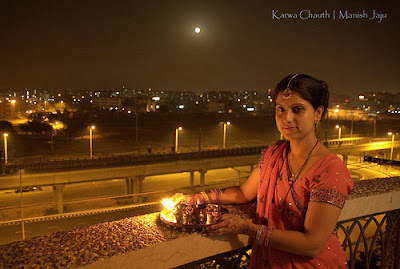 Karwa chauth is also known as ‘karak chaturthi’. Karwa refers to the clay pot by which water offerings which we call ‘argha’ is made to the moon. It is very essential for puja and it is given to the Brahmin or any woman as a ‘Dan’. This year karwa chauth will be celebrated on 11th October, 2014 (Saturday). Do fast on this day and pray for prosperity, longevity, and bliss for your husband. On this day women wake up in the early morning, take bath and wear new clothes for prayer. Goddess parvati, lord Shiva and other gods are worshiped. Moreover, they have to continue without water whole day. In the evening, as the sunset starts they prepare for puja and wear new sari and dress up like a bride. Furthermore, they prepare a dish for their husband. Karwa chauth puja Muhurat: 18:12 to 19:26. 1 hour and 14 minutes. Moreover, the moon rise on the day of karwa chauth will be at: 20.45. Besides, also note that chaturthi tithi begins at 10:18 on 11/Oct/2014 and ends on 09:33 on 12/Oct/2014. The karwa chauth puja is always done according to Muhurat timings. Karwa chauth is more celebrated in northern side than southern side. By doing fast woman express their love for her husband and pray for the health and good life of him. Husbands bring gifts for his wife and celebrate the day with a great pleasure. Happy karwa chauth!